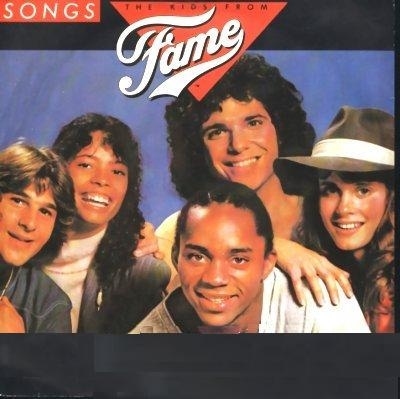 The Kids From Fame Songs released in April 1983 on LP (KIDLP004) and Cassette (KIDK004). It reached number 14 on the U.K. album charts. After 2 single sleeve album covers we are back to the excellent double gatefold sleeves with is release. It's another great picture especially as it folds out to reveal the whole season 2 cast. It's strange Debbie is on the back cover as she features so prominently on the album while Lori, Carlo, Lee and Gene who barely feature are on the front cover. This photo up to and including Debbie was used for the tour programme of the first U.K. tour and I always wondered if it was just luck that the first 6 people were the ones that performed in the concert or if it was actually planned that way? Inside there are more great pictures and information. It felt more like this album was planned rather thrown together like the "Again" album. A couple of the tracks have been re-recorded too and they are not just using the original TV versions. My only real issues with this album are how much it concentrates so much on Debbie where she's not included on the next album at all. It would have been nicer if they had spaced out the songs over the 2 albums so it felt more fairly distributed. "Be Your Own Hero" written by Enid Levine and performed by Erica Gimpel is a great up-tempo way to open the album and a song with a great message. Like a number of the tracks it doesn't quite match the exuberance of Erica's live performances of this song but had I not been to the concerts or seen them on TV I wouldn't know that. "Just Like You" written by Tom Saviaro & Jean Marie Arnold and performed by Debbie Allen, is an up-tempo Debbie blast. Obviously re-recorded for the album as Debbie doesn't actually sing it in the episode. For me it would have been nice as they were re-recording it anyway to include Erica, Valerie and possibly Lori on the vocals too, just to make it extra special. As I had this album before I saw the episode I was always surprised when Debbie didn’t' perform it in the episode. "There's A Train" written by Henry Gaffney and performed by Debbie Allen & Albert Hague. I like this song but always felt it seemed a little out of place on the album as Debbie and Albert make a strange vocal combination. It's a light jazzy bluesy number which definitely suits Debbie's vocal style and she shows the power of her voice but Albert basically just talks his lines. "Could We Be Magic Like You" written by Lee Curreri and performed by Lee Curreri and Debbie Allen with Lori Singer on Cello. This is another strange choice of song for this album. Basically this album is show casing season 2 songs as we've already had 2 albums for season 1 to have a season 1 song included here doesn't seem to fit for me. This song would have fitted quite nicely on the first album and one of Lee's season 2 songs could easily have been put on this album. However, if this song wasn't here Lee would have nothing to do at all on this album. Personally I don't think Lee and Debbie's vocals work very well together and the cello seems to make this song quite sombre. In reality it's a beautiful lullaby but for me that doesn't come across here and compared to the Live album version this doesn't compare. "Lay Back and Be Cool" written by Enid Levine and performed by Gene Anthony Ray. This is Gene's only song on the album and although it was featured very strongly in the episode and live concerts this has never been a favourite of mine. It has a great rhythm to it but there is something I don't quite like and could never get into the lyrics probably because at the time I was shy awkward teenager who knew nothing about being cool!!. "Songs" written by Dennis Scott and performed by Erica Gimpel & Carlo Imperato. This is a great song and my personal favourite on the album. It seems quite complicated for both of them to be singing different lyrics at the same time and makes the song very unique. Obviously re-recorded from the episode as Carlo replaces Jimmy Osmond and I really like Carlo and Erica singing together and this is Carlo's only appearance on this album. I always thought this was a great choice of a single and was shocked when it failed to chart. "Body Language" written by Steve Sperry and Barry Fasman and performed by Debbie Allen and Oren Waters. This is another great song and one of the standout tracks from Season 2. Another great choice as a single although having said that this was the second album in a row that the song appears on and with nothing new included on the single then it's not a surprise that it didn't do too well on the charts. Gene performs on the live version and as he was in the routine in the episode I always thought it was strange that he was actually singing on this record. Personally I like the live version more as it just has that increased energy. "Beautiful Dreamer" written by Paul Jabara & Jay Asher and performed by Valerie Landsburg. This is a pleasant ballad and suits Valerie's voice well but for me it's not quite up to the standard of some of the other ballads Valerie performs on the series. "Dancing Endlessly" written by Juli Davidson & George Tiboni and performed by Debbie Allen & Oren Waters. Oren seems to be getting quite a lot to do vocally on this album and much more than most of the cast members which was always a little disappointing to me. This is a pleasant song but I personally I would have preferred Debbie and Gene or maybe even Debbie and Carlo dueting together. "Bet Your Life It's Me" written by Michael Cruz and performed by Erica Gimpel. This is another great song to end the album on and a great hi energy performance by Erica which ends the album on a high note. Over all it's a good album but as mentioned the uneven spread of the cast members spoils it slightly and to be honest I don't feel the quality of the songs quite matches the classics from the first season. I also have to say that I always found it quite strange that the studio version of "Friday Night" wasn't included on this album. The live version had been a big hit here and as other songs like "Body Language" and "Could We Be Magic Like You" were on both this and the live album I expected the same of "Friday Night" which would have given the album some more publicity. Released June 1983 reached number 76 on U.K. charts. B-side Life is a Celebration live.